A small growing deciduous tree, Acer palmatum Butterfly has attractive and strong variegated on its 5 lobed leaves. It is the size and the strong variegation that make this such an attractive addition to garden, particularly in shaded areas. Although rarely reaching more than 4 metres in height, Acer palmatum Butterfly under ideal conditions can grow a little larger than this. Best planted in a position where it is protected from full sun, very hot sun and strong drying winds. Because of its size it can be used to plant beneath taller trees which will afford it some protection. Autumn tones turn to yellow orange and a touch of red. 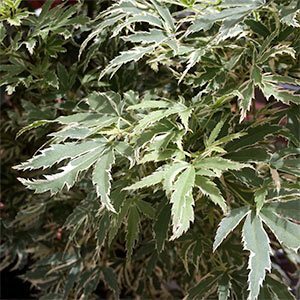 With its variegated foliage this is plant that grows best in a little shade. It does like moist soils, however wet soggy soils are not suitable. Plant at the same level that it was in the container. Mulch around the plant to maintain a cool root run and help with moisture. If growing Acer palmatum Butterfly in a container, choose a high quality potting soil, use a general purpose slow release fertiliser each spring. Being smaller growing this is an excellent Japanese Maple for small gardens and is also suited to growing in containers in courtyards. A brilliant feature tree in a Japanese style courtyard garden. Try underplanting with an ornamental grass such as Liriope muscari, Dwarf Mondo Grass or perhaps Epimediums. Acer palmatum Butterfly – Summary Information. Height – Will reach 3 – 4 metres in height over time. Spread – This is an upright vase sapped tree with a crown of around 2 meters over time. Position – Best in a position with light shade or afternoon shade. Foliage – Olive green with a strong creamy white variegation on the leaf margins. Leaves are deeply lobbed.